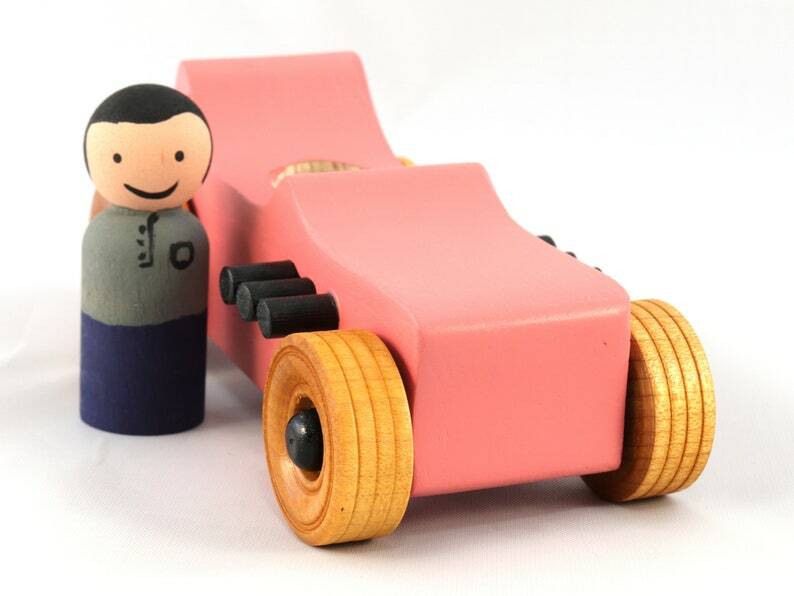 A handmade wooden toy car for children three years old and older, sturdy, durable, and made to withstand a little boy's rough play. With a bit of care, they should still be around for the next generation. I made the original set of Hot Rod Freaky Fords for my grandson Odin, my Quality Assurance Inspector when he was two years old. After more than two years of hard play, they are still going strong outlasting many factory made plastic toys. Like all my toys they are grandson tested and approved. I make every effort to make sure my toys perform well. The axles are sanded smooth, waxed, and nylon washers are inserted between the wheels and the body to ensure the toy rolls smoothly, and the wheels do not rub against the car body. I carefully test each toy before it is put up for sale. With plenty of help from my grandson, we tested many ways of attaching wheel using the unscientific method of ramp races. The toy cars were rolled down a ramp to see which one went the fastest and rolled the longest distance. There are four cars in the Hot Rod Freaky Ford Series. These are handmade from real wood and manufactured wood products. Each toy is a little different. The one you receive may not look exactly like the one in the photographs. The variations will be small and probably unnoticeable. I combine shipping for multiple items and strive to give my customers the lowest rates possible. Custom orders are welcome. I can make these from Pine, Oak, Poplar, Plywood MDF and other materials. Larger or smaller versions are possible. Please contact me for custom order pricing.